Bolivia is the third-poorest country in the western hemisphere. Bordered by Peru, Brazil, Paraguay, Argentina and Chile, Bolivia is a country of extremes, from the high, windswept plains of the altiplano and Lake Titicaca, to lush jungle, salt flats and dinosaur tracks. Its remoteness has left traditional Bolivian lifestyles relatively untouched. 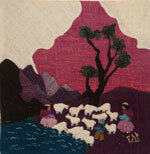 The country is rich in handicrafts, notably weaving. 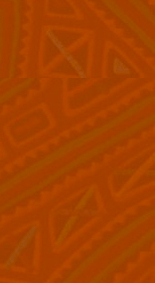 Each region has its own motifs and dress. Girls learn to spin and weave at a young age. While tending flocks or caring for children, women can be seen spinning thread using a traditional drop spindle. Crossroads Trade buys from initiatives in several areas of Bolivia. From a small, self-organized group of women, to a large cooperative coordinating eighty producer groups, these artisans seek both to practice traditional arts and develop commercially viable products. Crossroads Trade carries the finest Bolivian weaving available today as well as commercial products. We work closely with producer groups to design and test products, such as alpaca throws, sweaters and Christmas ornaments. In addition, we seek out coin purses, dolls and other products with broad appeal. By buying the small, commercial products made by many artisans, Crossroads Trade helps support many families. When the state of Israel was created as a homeland for displaced Jews,Palestinians already living there were, themselves, displaced. Sent to makeshift refugee camps in 1948, hundreds of thousands of Palestinians today still live in these camps in squalid conditions and utter poverty. Crossroads Trade purchases its Palestinian work from several sources. We are proud to sell fine embroidery, made by an association of women living in seven refugee camps in Lebanon. Life in the camps and in Lebanon in general is rife with social and economic disruption. Due to high unemployment and declining tourism, the association has been unable to build a market for its extraordinary work. Through its purchases, Crossroads Trade helps women sustain their families and maintain their traditional ethnic arts. We also purchase work from an employment project that provides work for the deaf and deaf education in Gaza. It is the sole source of deaf services in Gaza. We purchase their ceramics, dolls, cards, ornaments, bags and accessories. Because of the embargo on shipping from Gaza, it is very hard to move merchandise in and out. The project has had to close intermittently because of its difficulty in getting raw materials. Our shipments have been irregular; we bring things in when we can. Crossroads Trade has several suppliers on the West Bank, whom we found through on-the-ground scouting. A women’s employment project in Jalazon refugee camp makes nativities and dolls, sought out by collectors. Young adults with developmental disabilities make art cards in Beit Sahour. We purchase glass and ceramics from a fair trade company in Hebron. 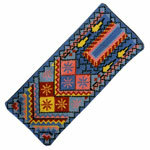 We carry embroidery from women’s employment projects in Ramallah as well. We will continue to import these beautiful products from the Occupied Territories as often as possible. We appreciate your patience when placing special orders. At the juncture of North and South Americas, many cultures converge in Panama. The land was already peopled by many Indian tribes, the present-day Wounaan and Guaymi Indians among them. Spanish colonizing forces were the first to recognize the strategic value of Panama's location as the narrowest point between the Atlantic and Pacific. Many countries including Great Britain, the US and France set their sights on Panama as well, as the optimal link between the Atlantic and Pacific Oceans, the gateway to South America and its riches, plantation land or as fertile territory for missionaries. 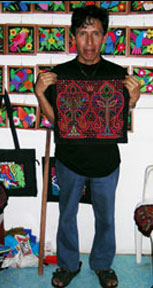 In Panama, Crossroads Trade buys from Kuna, Wounaan and Embara Indian artisans and cooperatives. The Kuna Indians live in Kuna Yala (land of the Kuna), or Comarca San Blas, an archipelago of some 350 islands off the north coast of Panama. Coconuts, transported to Cartagena, Colombia, are the main cash crop. Fishing, hunting and subsistence farming on the mainland are the dietary staples. Mola making is increasingly a source of income for Kuna women. The Wounaan and Embera Indians inhabit Panama's Darien province, among the most remote territory in the hemisphere. Increasingly encroached upon by loggers and settlers, the Darien and Los Katios National Park in Colombia remain the last holdouts in completing the Interamerican Highway. Practitioners of subsistence hunting and farming, the Wounaan and Embera live deep in the rainforest. Rainy season activities are the men's vibrant wood and tagua nut carvings, and the exquisite basketry of the women. Peru is a country of varied terrain and a staggering array of ethnic art traditions. With three distinct climates — coastal desert, highland and jungle — pre-Colombian artisans of various regions used local resources or traded to obtain sought after materials from other areas. The Spanish conquistadors brought with them new influences. Catholicism was blended with indigenous beliefs, and new imagery was fused with traditional motifs. Now, these ancient arts find contemporary uses, such as woven rugs, ceramic pieces or alpaca sweaters, while still utilizing traditional methods and materials. Motifs seen on ceramics and in weavings reflect Peru's pre-Colombian cultures. Still, ethnic arts of Peru are at risk. Crossroads Trade helps support projects such as the Center for Traditional Textiles, a collaborative of villages working to preserve their traditional dying and weaving techniques.